Vote Smart data is provided to the public free of charge and we offer a variety of tools to help you use, customize, mash-up, and share our content. In order to maintain these tools and keep our data abundant, accurate, and relevant, we ask those who find our services useful to help us if you can, but even if you can't, USE US. Link to Vote Smart: We have easy-to-embed banners and logos in all shapes and sizes, making it easy to reference and highlight Vote Smart resources. Vote Smart API: Our Application Programming Interface (API) gives developers maximum flexibility to create web pages and applications using all or selected parts of Vote Smart's databases. The API will respond to simple requests for data, such as 'get bio information for candidate Y' and 'get Votes for candidate X.' Example uses of our API include: generating official ballots for military and overseas voters, mashing up our committee data with candidate's finance data to create the L-Cat tool, and providing candidate summaries on national news sites. 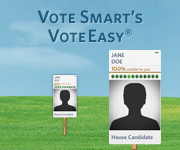 Widgets: Embeddable widgets make it easy for individuals and organizations to provide Vote Smart's online resources to their own communities and audiences. Our candidate and officials look-up widget has been featured on state and local news sites, sites of politically-active organizations, blogs, and even on several government websites. For limitations on use, see Copyright and Attribution.